The traditional and most common type of surgery for aortic aneurysms is open chest repair. It involves a major incision in the chest. General anesthesia is needed with this procedure. The aneurysm is removed and the section of aorta is replaced with an artificial graft made of material such as Dacron® or Teflon®. The surgery takes 3 to 6 hours, and the patient remains in the hospital for 5 to 8 days. It often takes a month to recover from open chest surgery and return to full activity. Open chest surgeries have been performed for 50 years. More than 90 percent of patients make a full recovery. In endovascular repair, the aneurysm is not removed, but a graft is inserted into the aorta to strengthen it. This type of surgery is performed through catheters (tubes) inserted into the arteries; it does not require surgically opening the chest. To perform endovascular repair, the doctor first inserts a catheter into an artery in the groin (upper thigh) and threads it up to the area of the aneurysm. Then, watching on x-ray, the surgeon threads the graft (also called a stent graft) into the aorta to the aneurysm. The graft is then expanded inside the aorta and fastened in place to form a stable channel for blood flow. The graft reinforces the weakened section of the aorta to prevent the aneurysm from rupturing. 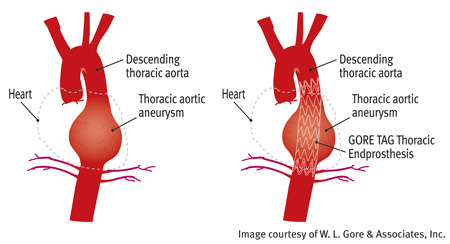 The above illustration shows the final placement of an endovascular stent graft in a thoracic aortic aneurysm. Endovascular repair surgery reduces recovery time to a few days and greatly reduces time in the hospital. The procedure has been used since 1999. Not all aortic aneurysms can be repaired with this procedure. The exact location or size of the aneurysm may prevent the stent graft from being safely or reliably positioned inside the aneurysm. Please feel free to download and view our booklet on heart surgery information for patients and their families (1.7MB, PDF). More information is available on the Cardiovascular Center Fenestrated Endograph or Endovascular Repair (EVAR) website pages.